Things are just not always as they seem, are they? We want to look all put-together (at least once in a while! ), we try to hide the imperfections in our attitudes and we keep any signs of self-consciousness behind closed doors. And our pasts, let’s just say we can leave those behind us, right!? It’s understandable, really. Why would we want to divulge what others might judge us for before they’ve fallen in love with us first? So, we put our best faces forward and hope any ugliness is only revealed after it’s already forgiven. But because of that, how many people really know you? For me, it’s not many--although I admit much more than I ever expected I would when I write! So, what would those who truly know your heart say about you? How would your friends who know that person filled with human flaws describe you? I think about that sometimes. I wonder. While I suppose I don’t always want to know, I hope most accept me for and even because of my imperfections, that they love me even with the flaws that I sometimes hide. But, you want to know what I truly believe about all of us? I believe that, while we work so hard to hide, if we took the time to look more deeply at those we hardly know, we’d actually find far more beauty than faults and flaws. Not because faults don’t exist, but because it’s God who created us at our core. Beyond the outside, deeper even than the flaws, we’d find what God wonderfully made! So, no, things are not always what they seem. And sometimes what we hide isn’t pretty. But, it might just take a little time to scratch past the pretty and dig deeper than the dirt to see the beauty in each one of us. Somehow quinoa had me thinking about all that! Probably because quinoa isn’t at all what it seems either! It’s got its own unique flavor which can be a bit overpowering. But in some dishes, like this one, it blends perfectly! It’s often called a grain, but it’s not at all in the grain family! It’s a SEED. What’s more, quinoa is related to beets and spinach by its familial roots. Even in its tininess, it offers a complete vegetarian protein profile along with lots of magnesium, iron, manganese and copper. What I think I love most, though, is that it’s gluten free and super filling because of the fiber encouraging slow digestion. I could go on and on, but I think you get it, right? 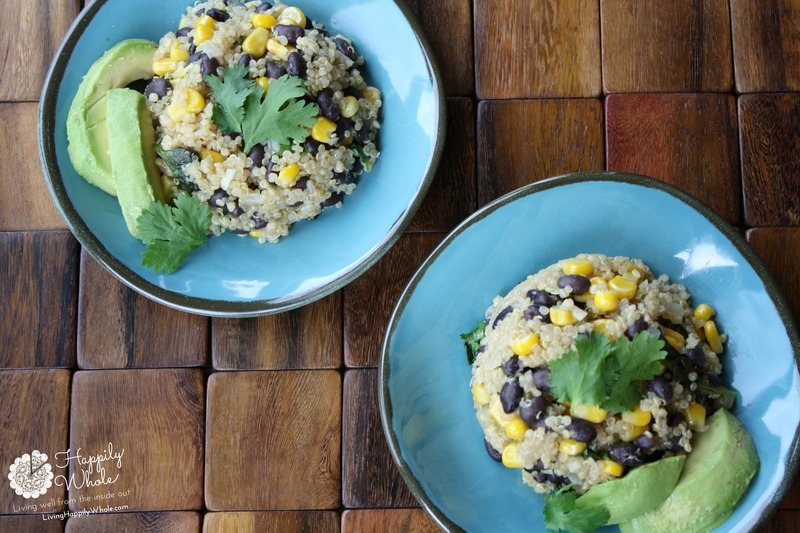 Quinoa offers more than meets the eye. You’ll find it sprinkled all over in healthy snacks, meal recipes and even in baking ones. Now it’s available in just about every grocery store. All because people started looking a little deeper at what they were first uninterested in. 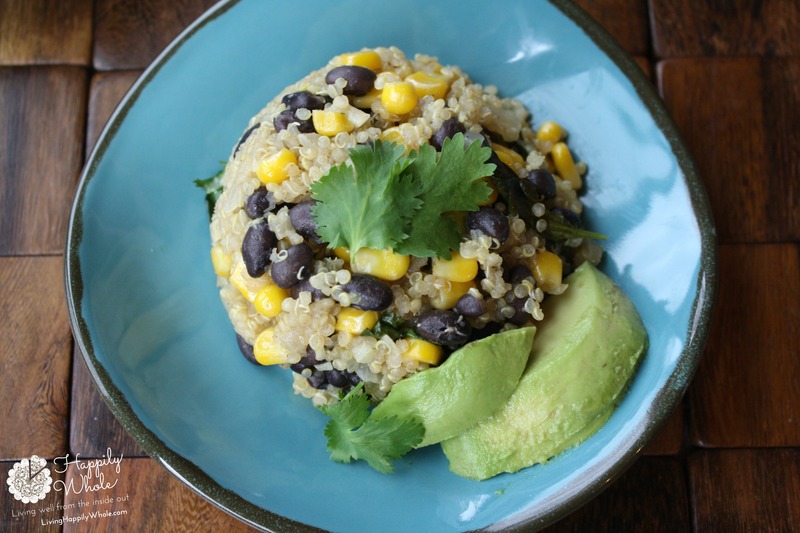 So, consider quinoa….and look for the beauty every day because it’s in just about everything and everyone! 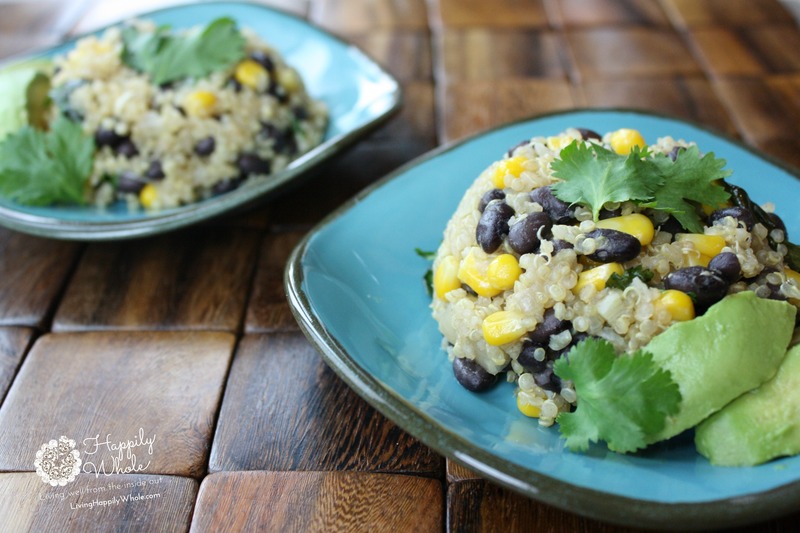 Filled with phytonutrients, fiber and protein this combination of black beans, quinoa and corn is a great way for both experienced quinoa eaters and novices to enjoy its health benefits. I've served this nutritious dish at home, parties and presentations and each time it results in rave reviews. I often eat it atop a bed of greens but you can enjoy it as a side or even a vegetarian main dish. In a large pan, sauté onion and garlic in the coconut oil for a few minutes until slightly opaque. Mix quinoa, broth and seasonings into the pan. Bring to a boil, cover and reduce heat to a simmer for about 20 minutes. Stir in corn and simmer 5 minutes more. Stir in black beans and cilantro. Enjoy as a side dish, a vegetarian main meal or even atop a bed of greens. It can be eaten warm or cold...pick your preference! *I sometimes find that keeping some Rapunzel vegetable bullion cubes on hand is helpful for when I look in the pantry and I've either forgotten or used all my broth. I love keeping these Rapunzel cubes on hand. Buy Rapunzel broth cubes here. I love this sprouted quinoa (anything sprouted is more nutrient dense, more like a LIVE food and easier to digest. Buy it here!